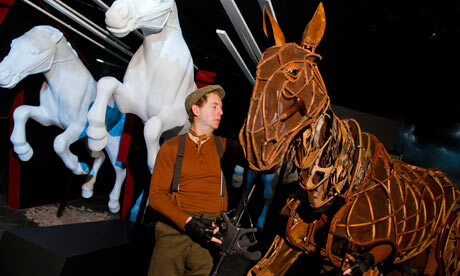 Michael Morpurgo’s classic is the basis of a National Army Museum exhibition tracing the history of the real war horses. His story of the horse commandeered from a Devon farm and shipped to the great war, followed by the boy who loved him, has become a phenomenon, dwarfing the rest of his works: a bestselling children’s book now bought by adults, a box office smash hit play for the National Theatre in London and on Broadway, the Spielberg movie due for release within few months, and now an exhibition at the National Army Museum in London. The book was hardly an overnight success: it was published in 1982, did not sell particularly well. Morpurgo spent years trying to turn it into a script before concluding that a story which begins in rolling Devon fields and moves on to tank battles in the Somme, was unfilmable and still less stageable. “I am delighted but quite surprised at how it has now taken off, and why that should be now is an interesting question. I’m afraid it’s the times we are living in. People are seeing the bodies of young soldiers coming home again.